We did it again! 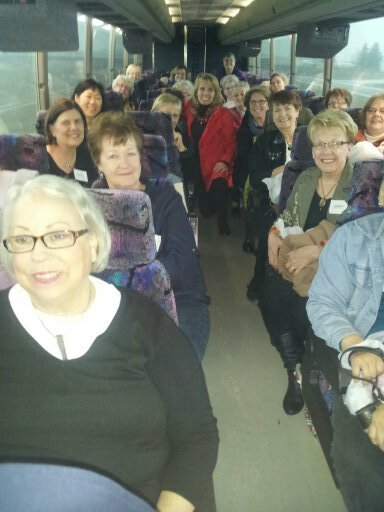 A group of beautiful women and I took a bus trip to my favorite consignment shops. We had a great day finding the right clothes and accessories at the right prices. Want to go with us next time? It’s easy – sign up for my newsletter, Got a Minute? Get Some Style! right here on this page. I always list these trips in the upcoming events. The newsletter is free and full of fashion tips – you really can look fabulous fast! Jill Swanson, owner of Beauty Made Easy, image coach, style consultant, corporate speaker, national speaker, and the author of Out the Door in 15 Minutes, Simply Beautiful Inside & Out, Simply Scarves, and Simply Closets. Want to look fabulous fast? Learn how with my new book, Out the Door in 15 Minutes! You can purchase it here on the site, at www.jillswanson.com or from Amazon.